Last weekend I was at a friend’s place to feed and play with her cats while she was away. While waiting for the scaredy-cats to come out from under the bed, I flipped through a summer food issue of Sunset magazine, and this recipe caught my eye. Since strawberry shortcake is Chris’s absolute favorite dessert ever, and we were making dinner for a friend on Tuesday, I figured I’d throw this in for dessert. It’s so easy to do, and is an interesting twist on regular strawberry shortcake (which I think is kinda boring, sorry!). I do want to note that angel food cake was shockingly hard to find. I went to four stores looking for it, and finally found one lonely cake on the Key Foods shelf right before I was about to break down and bake it myself. First, beat 1/2 cup of whipping cream together with 1/2 cup of crème fraîche, 2 tbs brown sugar, and the zest of 1/2 a lemon until it’s stiff and set aside. Put 5-6 tbs of strawberry jam in a bowl and microwave for 30 seconds. Using a pastry brush (or just dunk them), coat hulled strawberries with the jam. 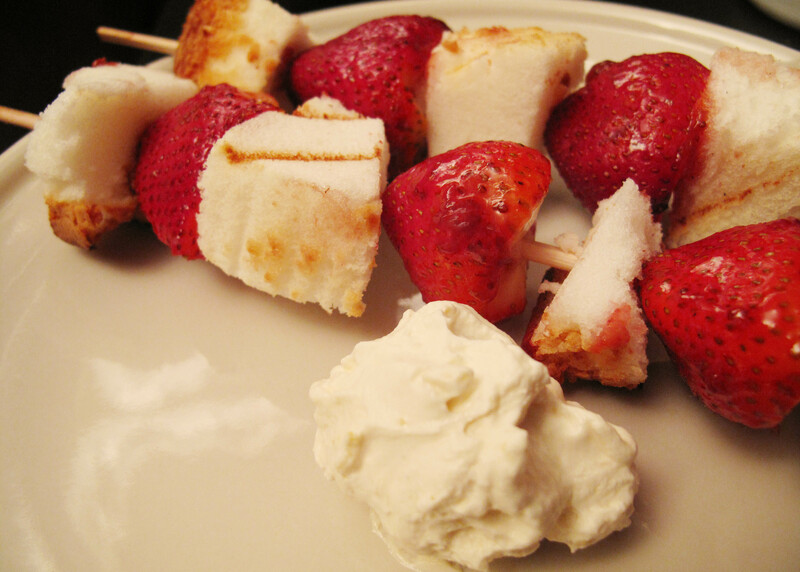 Cut chunks of angel food cake and thread strawberries and cake in an alternating pattern onto bamboo skewers. Grill the skewers (I just used my cast iron grill pan on the stove) for about 3-4 minutes and serve with the lemon cream. This entry was posted in Cooking adventures and tagged dessert. Bookmark the permalink. sounds yummy, Ilona! I am going to try it while we are on vacation in Westport!